Sweet potatoes are extremely healthy and can be a perfect snacking option. We all love to snack on French fries, potato chips and popcorn. But are these healthy? Not at all! These snacks can increase the intake of calories and may eventually lead to weight gain. But then what is the right snack option for you? In this case, snacking on sweet potato chips is a perfect option and a healthy alternative to your favourite junk food. Sweet potatoes have a lot of nutrients one can imagine. They are an excellent source of beta-carotene, antioxidants, vitamin C manganese and copper. The main ingredients that go into this dish are sweet potatoes, salt and cooking oil (preferably olive oil, coconut oil or ghee). Health expert Luke Coutinho in his recent Instagram post talks about grilled sweet potatoes wafers as a healthy snack. The fiber in sweet potatoes can help in keeping you satiated. This will further help in reducing the overall weight of an individual. The more full you feel throughout the day, the less you will snack and overeat in the next meal. This will help you manage your weight effectively. The fiber content in sweet potatoes is higher than that of normal potatoes and even better they taste good too! Fiber is easy to digest and will help in keeping stomach disorders at bay. They are soothing to the stomach and intestines, so you do not face any difficulties in digesting them. Nutrients like beta-carotene, magnesium, zinc, and vitamin B complex make sweet potatoes a highly important food that helps in managing arthritis. The water in which the sweet potato is boiled can also be applied externally on joints to ease the pain of arthritis. 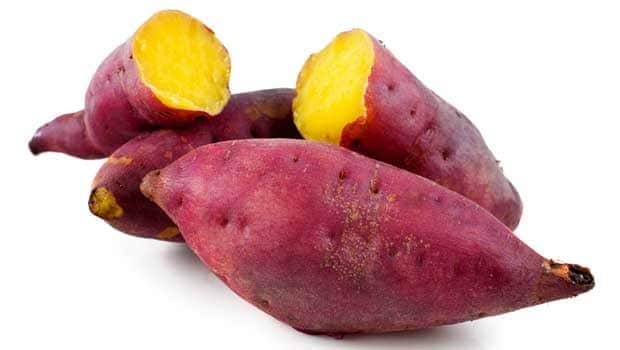 Another important health benefit of sweet potato is that they help in managing high blood pressure. Sweet potatoes contain considerable amounts of both magnesium and potassium. Both the nutrients are essential in managing hypertension. This can further help in reducing the chances of individuals suffering from cardiovascular diseases. Making sweet potato wafers is very simple and extremely healthy. You need to slice sweet potato as thin as possible. You can toss slices in a touch of olive oil and then sprinkle some salt and chilies over it. Instead of deep frying these wafers, you can bake or grill them in order to make the dish all the more healthy. Also read: Does Snacking On Almonds Help Lose Weight?